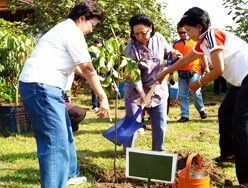 Early this December, in conjunction with the government program to plant and protect trees that is headed by Mrs. Erna Witoelar, the Indonesian Tourism Society invited Kampoeng Djamoe Organik � Martha Tilaar to participate in a similar event on Monday, 1 December 2008. The event will be attended by Fahmi Idris, Minister of Industry, to directly oversee 500 people�consisting of 250 students and college students from Trisakti�s tourism school, and 250 people from the hospitality service, travel agents, and tourism board�who are going to plant 500 trees (250 breadfruits and 250 medicinal plants, cosmetics, and aromatherapy) simultaneously. The cool breeze coming from the lush forest, the luminous surface of the crystal clear water of the pond, and the expansive verdant rice field are all common sights in villages across Indonesia, but it�s rare to find it in our daily lives in big cities such as Jakarta. The relaxing atmosphere will carry our thoughts back to our past, when our parents live in pristine villages. 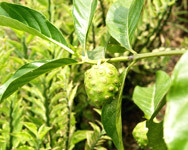 Plots of medicinal plants, such as TOGA (Tanaman Obat Keluarga, or Family Medicinal Plant), can also be found here. With Manadonese wood-based traditional house on the left side of the pond and a Sundanese bamboo-based house on the other, it will make it difficult for you to leave Kampoeng Djamoe Organik (KaDO), one of the proofs of Martha Tilaar's love for the environment. As an educational center and environmental training, KaDO offers various training program packages, starting from organic cultivation, post-harvest to the usage of plant ingredient. 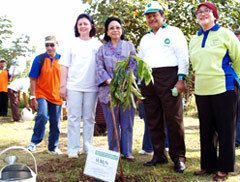 There are also a learning and recreational program for children and empowerment program for everyone. 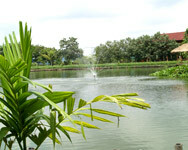 At the center of KaDO area is a pond large enough to go boating. The rows of organic rice fields lining the pond look gorgeous when the paddy starts to turn yellow. The presence of a healthy food canteen at the ground floor of the Manadonese traditional house will add one more special experience for you and your family as you can enjoy lunch in a wonderful pastoral surrounding. 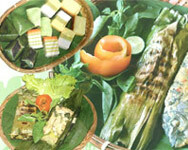 Maybe for some of you a home Sundanese cooking is not really that unique. Especially for those who live in Jakarta because there are many restaurants offering that menu in every corner. 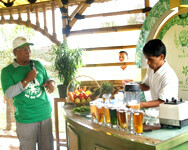 But Kedai Sehat Alami offers a delicious and healthy menu because the ingredients use organic produce so you don�t have to worry getting chemical residues. The slow food process at Kedai Sehat Alami might make the food longer to serve but it's all to guarantee that the food will be served warm and fresh. While waiting for your food, you can relax while enjoying the surrounding that is noticeably absent of the cacophony sound of city vehicles. You can watch farmers working the land. This is the right time for you to interact with nature and be grateful for all of His creations. The menu that will be waiting for you are savory nasi kastrol or nasi timbel with banana leaves aroma, oseng pare, salty peda fish, plus mouthwatering cooked chili, all served on a bamboo plate. So the next time you and your family plan to take a ride to the Lippo Cikarang area, don�t forget to stop by at Kampoeng Djamoe Organik. 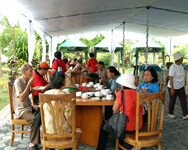 When else can you have lunch while enjoying the pristine rural life that can relieve your stress? 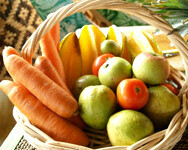 Before going back home, you can buy seeds of paniculata, keji beling, tapak liman, temu-temuan, and many others. 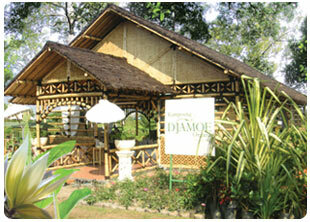 Kampoeng Djamoe Organik should be a new family destination alternative for your family.